Hi, everyone! 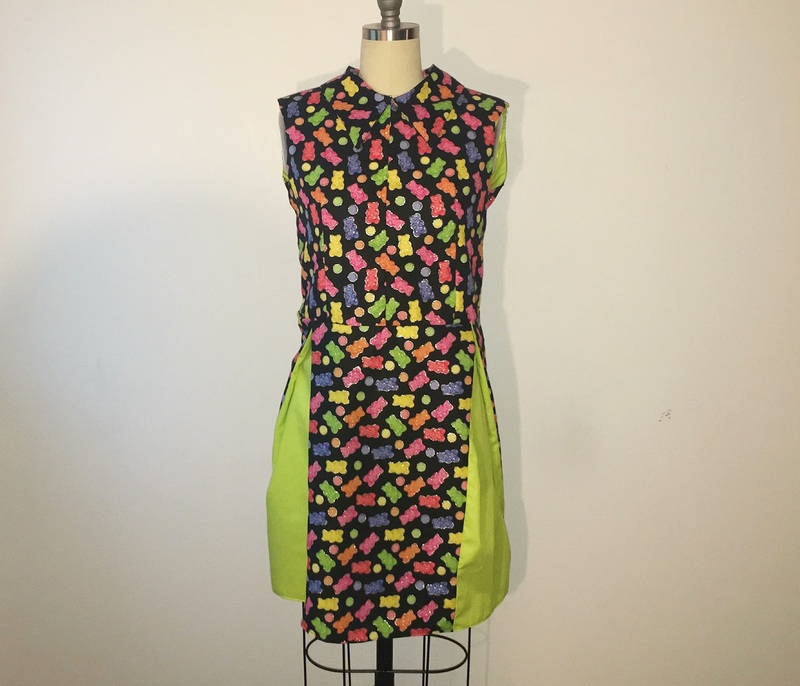 In this blog post, I want to show my process of how I made my gummy bear dress. It's a pretty simple dress, but I figured I'd share it with you anyway just in case you want some ideas! I found this bright fabric. I decided to use it for the inside of the pleats found in the dress. I draped the top of the dress on my mannequin in muslin. For the back of the top, I decided to cut a half "V" so that when the two pieces of the back are put together, it would form a triangle. For the skirt of the dress, I wanted to make "cheerleader" pleats that have color showing underneath them. To do that, I cut out 7 rectangles about 6 inches wide and 12 inches long. However, the length can be however long you want your dress to be. Then, I used the muslin piece I made earlier to trace and cut out my front and back pieces from the gummy bear fabric while adding an extra layer underneath of the green so it wouldn't be see-through. What I did at this point was sew right sides together of the shirt then turned them inside out. From there, I connected all of the rectangles together at the longer sides then layed them out. Next, I took the corners of only the gummy bear fabric and brought them together at the top while leaving the green still showing to make the pleats (An in-depth video will be uploaded to my YouTube channel soon). After all that was done, I connected the top with the skirt then added the zipper down the middle back to make the triangle. For more detail and "cuteness", I added a collar (An in-depth video will be uploaded to my YouTube channel soon). This is how it looks all finished! I believe the total amount of time it took me to make this dress was about 5 hours. Hi Hawwaa! 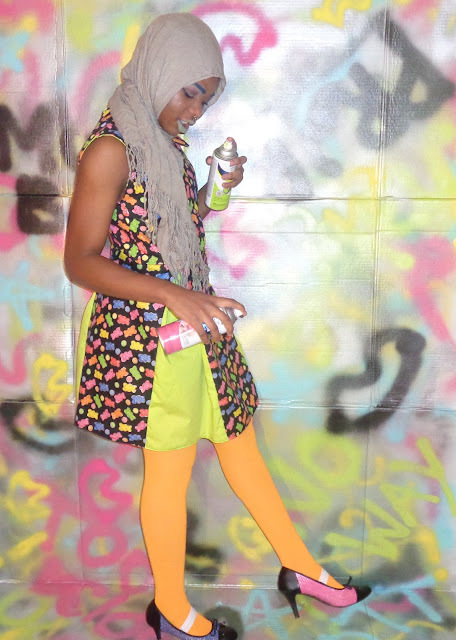 I just was watching Project Runway Junior and I really liked your colorful fun-loving style. I'm sorry other people are mean to you. I think that you are incredibly classy, nice, and really talented. Best of luck in all you do.